We like to keep our customers up to date with the latest happenings of our store. We send a monthly email that contains product pricing comparisons and Automation Industry information of interest. You can automatically remove yourself at any time. We will not give your details to anyone, guaranteed. Free Software Toolbox for simulation and diagnosis in addition to information available from Siemens STEP7 / TIA Portal, or WinPLC7 software. The CANopen� bus coupler is designed to connect a CAN bus to TB20 peripheral modules. 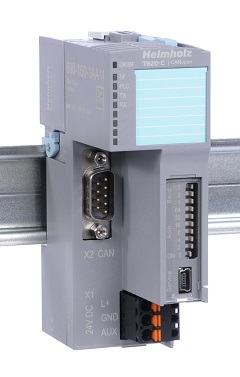 It supports the CANopen� protocol as defined in DS 301 and uses the DSP-401 profile for digital and analog I/O modules. A functioning TB20 configuration will always require a bus coupler and at least one peripheral module, but can accommodate up to 64 modules of any kind connected in series with the bus coupler. The bus coupler supports hot-plug for replacing modules during operation. In addition, this coupler makes it possible to use SDOs to freely access all I/O values, parameters, and diagnostics, and can manage up to 192 bytes of I/O data with the PDO protocol. The 24 V power supply connector, the final bus cover, and the base module are included as standard. TB20 ToolBox makes it easy to methodically design TB20 systems. Integrated terminal mapping, system width calculations, and Current-carrying capacity monitoring all make it possible to quickly design systems without making any mistakes. ��USB device port for online diagnostics, configuring parameters, setup, and firmware updates with "TB20 ToolBox"